The Reserve Bank of Australia (RBA) decided to keep the official cash rate at 1.5% during its April meeting – taking a ‘wait and see’ attitude before the Federal Budget was released. The measures that were announced in the Budget to support economic growth are likely to influence the RBAs decisions in coming months. Many analysts are still calling for cash rate cuts, however this is probably a situation the RBA would rather avoid. Meanwhile, last month some lenders cut rates on fixed rate home loan products. These are highly competitive at present and may be worth considering if you’re in the market for a loan. Stephen Anthony, Chief Economist with Industry Super Australia was recently quoted as saying: “The housing price correction is really scaring the horses…” But despite this and similar commentary in the media, home value falls have slowed considerably over the past month. The ACT and Tasmania have even been enjoying home value increases in recent months. A market correction is quite normal following a lengthy period of steady gains. This property market correction may be considered great news by those who have been waiting for a better time to get on the property ladder. Some areas are holding value better than others, so it pays to do your research before putting down a deposit. The number of auctions and clearance rate figures continue to decrease as private sales numbers rise. 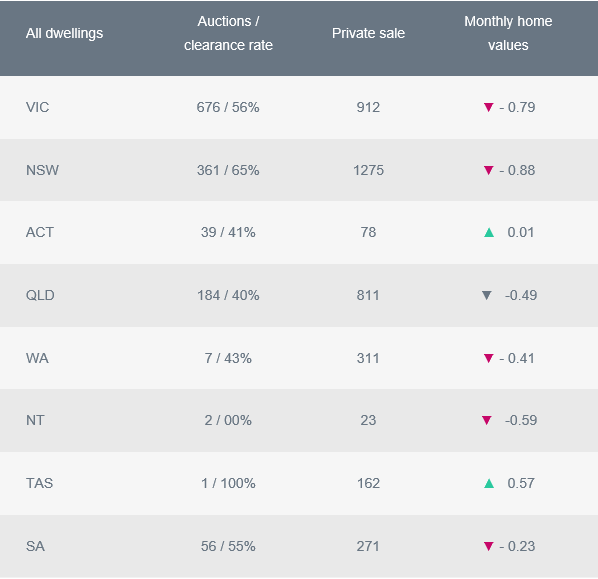 The table below provides a snapshot of last month’s property market and home value changes during the last week of March, (according to CoreLogic on April 1). In today’s market, it is very important to see us to get a pre-approval on your loan before you start shopping for a home. Don’t be tempted to put down a deposit before you see us – your borrowing capacity may have been affected by the more stringent lending criteria that have been put in place following the Royal Commission enquiries. Remember, we have many lenders to choose from and are well placed to help you find the right home loan option for your needs. Please call us today to find out more.